Cultural Awareness, Race, and Equality (CARE) is a new organization at Brush geared toward improving school climate. 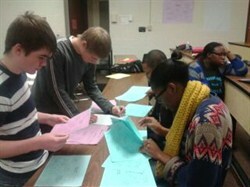 During the week of February 19th, the club sponsored a bullying awareness program. Students were invited to view the recently released documentary, "Bully", and participate in student led discussion groups following the film. During homeroom, all students were given a map of the high school and asked to identify 'hot spots' in the building where they know students have been bullied. Each day was devoted to educating about different types of abuse including cyberbullying, sexual orientation, sexual harassment and racial inequality. Informational video loops played on the televisions in both the cafeteria and the library and students were able to sign pledge cards to commit to standing up for those who seem to stand alone. CARE looks forward to continuing its mission to raise awareness and improve student relations.